CBIZ, Inc. provides professional business services that help their clients better manage their finances and employees. CBIZ provides its clients with financial services including accounting, tax and consulting, internal audit, merger and acquisition advisory and valuation services. Employee services include employee benefits consulting, property and casualty insurance, retirement plan consulting, payroll, life insurance, HR consulting and executive recruitment. CBIZ also provides outsourced technology staffing and support services, healthcare consulting and medical practice management. As one of the largest benefits specialists and one of the largest accounting, valuation and medical practice management companies in the United States, the Company's services are provided through more than 140 Company offices in 36 states. 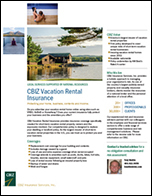 To learn more about CBIZ and its network of extended services, please click here or check out our CBIZ eBrochure.